On the 27th April 2017 at the Tenancy Tribunal in Dunedin, adjudicator Wilson made a ruling on a case that has sent alarm bells ringing and many think the ruling was grossly unfair. The former tenant Natalie Parry lodged a claim for a refund of rent after she found out that the property she was renting was not fully compliant. The landlord, Vic Inglis was oblivious that there was anything wrong. The property in question was personal and precious to the landlord. It had been the family home for 10 years. The property was in very good condition and the adjudicator acknowledges that the landlord made no attempt to avert Council laws or to exploit the tenants. The problem arose when the tenant became aware that the downstairs part of the premises did not have a permit for the work undertaken to convert the space into living quarters. 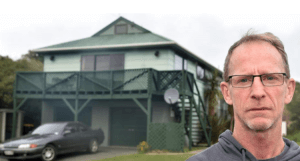 (Photo courtesy of Otago Daily TImes) Vic Inglis probably hasn’t been feeling great about being a landlord after a very tough decision went against him. What made the matter worse for the landlord was that the tenant only became aware of the issue when she sublet the downstairs part of the property without consent from the landlord. Mr Inglis was completely unaware that the downstairs did not have council consent as he had not got a LIM report (Land Information Memorandum) when he purchased the property over a decade ago. This was the only mistake he made but what a costly mistake to make. In a case that seems grossly unfair, a landlord had rented a property that was in a perfectly good condition to a tenant who had breached her agreement yet not only did she get nearly $11,000 in refunded rent, she pocketed over $3,000 from subletting the property without the consent of the landlord. Is Tenancy Tribunal Like Playing Russian Roulette? At Real iQ, we have examined this decision closely and have obtained the case notes. We are aware that Mr Inglis has appealed to the District Court so the decision may yet be overturned. However, we feel it is important to understand how the adjudicator came to this incredible decision and we also again provide evidence that going to Tenancy Tribunal can be like playing Russian Roulette. Let’s analyse Adjudicator Wilson’s decision. 1. Was the Tenancy Illegal? This is what Wilson believes. Yes, the downstairs did not have a permit but does that make the entire property illegal? The section adjudicator Wilson refers to in the Residential Tenancies Act is section 137; Prohibited Transactions. This eludes to the fact that you cannot enter into a contract that contravenes the provisions of the Residential Tenancies Act and that any money paid under the contract is recoverable to the tenant. 2. But was there anything actually wrong with the property? The answer to that is no. After finding out that the downstairs did not have consent Mr Inglis approached the council and was able to obtain a Certificate of Acceptance which then made the property fully compliant. No additional work was done. Yet Wilson states that the Code of Acceptance does not retrospectively make the tenancy lawful because the consent was not issued until two months after the tenancy ended. Therefore, in the eyes of Wilson, this was an illegal tenancy. 3. The Landlord’s Cross-Application Is Out of Here! Mr Inglis made a cross-application against the tenant due to damage to chattels and for the removal of smoke alarms which has maximum exemplary damages of $3,000. This was thrown out as the decision that the tenancy was unlawful meant that Tribunal had no jurisdiction to consider any of the landlord’s claims. Basically, the tenant could have been operating a Meth Lab and the landlord had no power to do anything about it. 4. Grounds for a Rehearing? No chance! Unsurprisingly, the decision did not sit well with Mr Inglis who immediately applied for a rehearing. However, there were no grounds for this. Section 105 of the Residential Tenancies Act refers to Rehearings. You can only seek a rehearing on the ground that a substantial wrong or miscarriage of justice has or may have occurred. In the opinion of the adjudicator, this has not happened on this occasion. This is a matter for a District Court if the landlord chooses to appeal. Meanwhile, in Christchurch, a landlord appeared to get off lightly in comparison with Mr Inglis. The case between Danielle Williamson v Green Gift Health and Wealth Ltd highlights the inconsistencies that plague Tribunal. On the 31st July 2017, Adjudicator Armstrong chose not to refund rent even though the property that was tenanted had a second bathroom without consent and a wood burner not compliant with the Building Code. In this case, Ms Williamson took Green Gift Health and Wealth Ltd to Tenancy Tribunal seeking compensation due to the poor condition of the property they had rented and the fact that parts of the property were non-compliant. Adjudicator Armstrong ruled in favour of the tenant yet did not refund any rent. This makes the Inglis decision seem very unfair as in the Christchurch case, the landlord clearly breached and would have been aware of the poor condition of the property. The property was not only non-compliant but also a health risk to the tenants yet the tenant was ordered to pay rent arrears to the landlord. The greatest frustration we hear about from Property Managers is how inconsistent Tribunal can be. In defence to many adjudicators, we have no doubt that many Property Managers attend unprepared and have limited knowledge of the act. However, our research does show that too often we get inconsistencies. One of our aims is to hold Tribunal accountable to their decision and to educate Property Managers so they are better prepared when attending Tribunal. The question this case highlights though is how many illegal tenancies are there, and does this give the green flag for tenants to seek thousands of dollars in rent refunds as many rental properties could have similar issues? Our advice to Property Managers is to ensure that the landlord is fully aware of the obligations to provide the property compliant with all legislation and if you suspect that a property may not be compliant, raise the question with your landlord and highlight this Tribunal case.